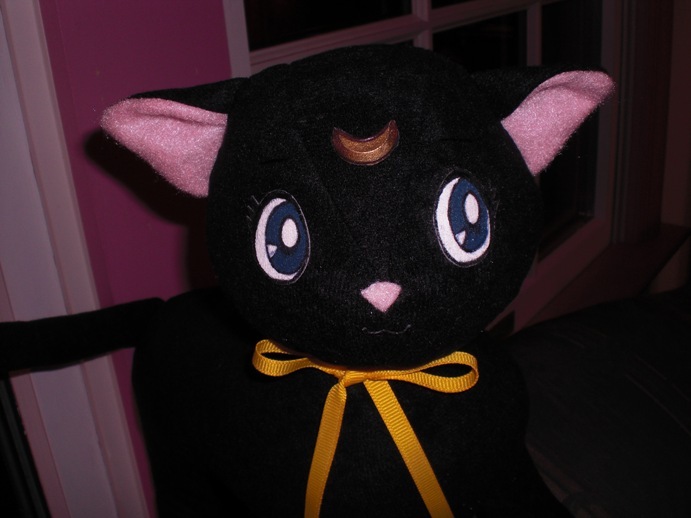 I used this pattern (http://dollmaker.nunodoll.com/cat/terrycat.html) for the body, ears and tail, though I enlarged the pattern and made the tail a bit longer. I drafted the pattern for the head myself, using an Irwin Luna plush I had already as a guide. She's made of black alova, with pink felt for her ear and nose. Her eyes and nose were drawn out on thin interfacing, colored with fabric paints and pens, and then cut out and glued to her face. It was an experiment, but I really like how much character she has as a result! And it's nice because her features are still visible on the dark fabric (especially her teeny mouth!) 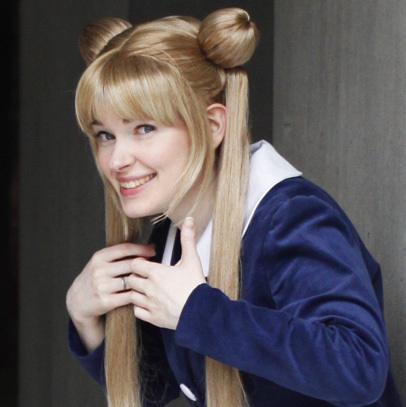 Since most of the Sailor Moon costumes I've made so far are manga-based, I gave her blue eyes instead of the red she has in the anime, and her cute yellow ribbon from "The Lover of Princess Kaguya".